To start the meal off, I went straight for the poppadews–tiny peppadew peppers filled with pimento cheese and then lightly fried. I’m telling you now, this is an addictive little snack that you’ll just keep poppin’ back in your mouth and before you know it you’ve eaten five and your dinner companion is looking at you, thinking, “Could you slow down and save me some poppadews, champ?” The creaminess of the cheese filling, the crunch of the fried coating and the tang of the peppers make me wonder why haven’t we seen this bar snack everywhere before. The other sides or starters I’d recommend are the scallops with a cornmeal pancake and tomatillo chow chow along with the classic mac and cheese casserole. 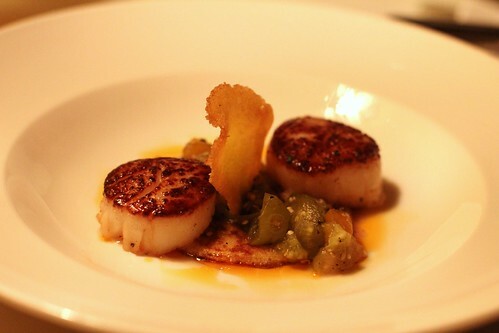 The scallops were perfectly seared on the outside and tender on the inside, and the cornmeal griddle cake was pleasantly light with a sweet corn flavor. 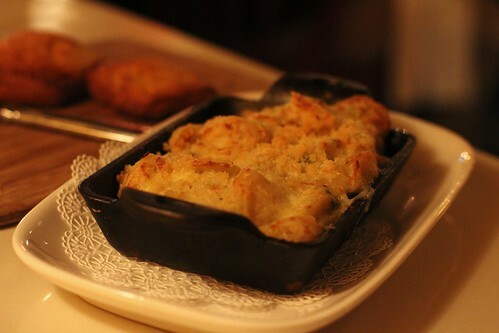 The mac and cheese (pictured above) was everything it should be: gooey and cheesy filling nestled into fat macaroni on the inside with the crumbly breadcrumbs topping on the outside. 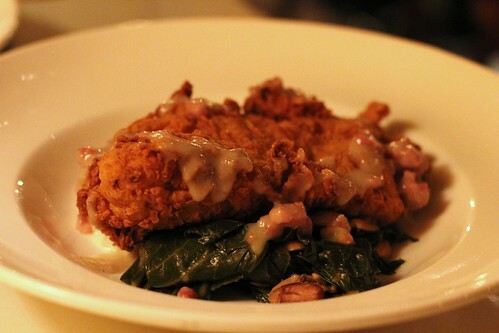 But what sealed the deal for me on the sophisticated southern fare was the buttermilk fried chicken. I’ll come out and say it: I’m not a fan of collard greens. Until this meal, I had yet to find collards on a dish that I legitimately enjoyed and didn’t just push around the plate like a sulky child. But these collards were silky and a little tangy and went very nicely with the hint of sweet in the sunchoke mash. As for the main star of the plate, the fried chicken was outstanding (and as a forewarning, it is kind of enormous. Prepare yourself accordingly). There was a little spice in the breading and entire combination of the dish in terms of textures and flavors–the boiled peanuts, sunchoke mash (as opposed to mashed potatoes), the braised collards, the sausage gravy, the crunchy fried chicken–all of it was thoughtfully executed. 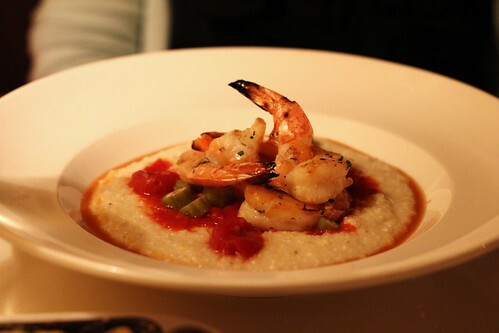 Not wanting to be that dinner companion, I tried a bit of the shrimp and grits. Whatever grit concoction you may have had elsewhere or cooked up out of a box, forget it. In the words of the popular 1992 film, My Cousin Vinny, “No self respectin’ Southerner uses instant grits.” Jeffords’ grits are creamy, buttery and light. I’ll admit, I had a little entree envy on this one. If you manage to save room for dessert (which I barely was able to on this journey), don’t pass up any of the confectionery treats from Tiffany MacIsaac, the executive pastry chef of NRG. While I only tried the hot chocolate dessert which was incredibly rich (for the record: not the best choice to share, unless you’re with a good enough friend that you don’t mind passing the mug back and forth to take sips), had I planned it better I would have gone for our server’s suggestion of the apple cobbler for two or three. Just remember to order it earlier in the meal since it takes about 25 minutes for the kitchen to prepare. The revamped Evening Star Cafe doesn’t rest on its original reputation or skimp over the new menu while distracting you with a pretty new interior. 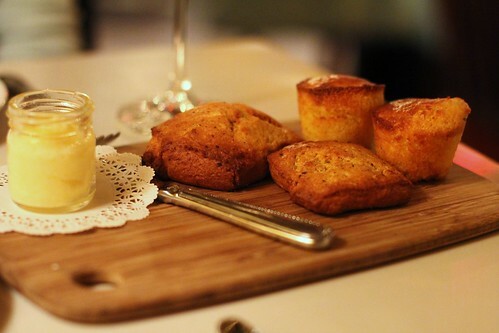 The dishes are thoughtful and chef Jeffords puts in the time and effort to craft delicious and elegant southern-inspired dishes. Next time you’re in the Del Ray neighborhood, pop on over for dinner or even Sunday brunch. 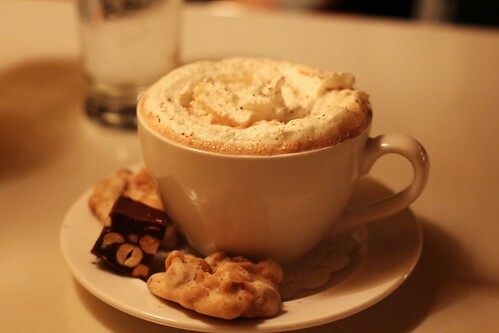 Evening Star Cafe is located at 2000 Mt Vernon Avenue, Alexandria, VA 22301-1310. You can make a reservation by calling 703-549-5051. While the new downstairs menu is outstanding, I dislike how the upstairs menu has been reduced to bar foods. It used to have a greater variety of choices and wasn’t primarily focused on heavy/fried foods.